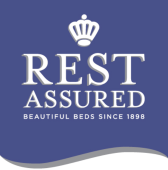 Rest Assured have been making beautiful beds since 1898. Collins Furniture has been selling their beds since 1987. We feel they offer a good combination of luxurious quality at affordable prices. While they have the heritage of a traditional bed manufacturer, they have a clever knack of combining their traditional quality with innovative products. For example, their Sanctuary Range offers a layer of 1400 mini springs, in a luxurious pillow top, built above a traditional pocket spring mattress. They also offer ranges of beds which combine latex or memory foam layers with traditional pocket springs. Rest Assured are one of the few manufacturers to offer a range of firmer orthopaedic pocket sprung beds.